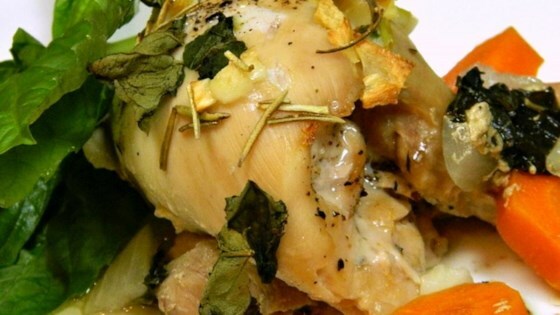 "Very easy recipe using chicken thighs, garlic, basil, and rosemary. Serve with rice." Arrange chicken thighs in a roasting pan; season with salt and pepper. Scatter onion over and around chicken. Top chicken with basil, garlic, and rosemary. Pour chicken broth into pan and evenly distribute carrots around the chicken. Cover pan with aluminum foil. Cook in the preheated oven until chicken is no longer pink at the bone and the juices run clear, about 1 hour. An instant-read thermometer inserted near the bone should read 165 degrees F (74 degrees C). Remove aluminum foil and continue cooking until chicken is browned, 10 to 15 more minutes. Quick, easy and very tasty. We doubled the garlic and onion because that's just the type of family we are! Love a dinner dish that you can quickly prep, place in the oven, and then relax with a glass of wine while it cooks to perfection! Easy meal with good flavor that makes the kitchen smell great. My family loved this, I substituted the carrots with mixed veggies, and made cheesy garlic mashed potatoes to go with it.